Civic Center Residents Coalition NYC: From City Hall News "Chinatown pushes back against Mayor's reelection"
From City Hall News "Chinatown pushes back against Mayor's reelection"
When he ran for re-election in 2005, Mayor Michael Bloomberg had few bigger boosters than Eddie Chiu. Chiu, head of the 109-year-old Lin Sing Association social club in Chinatown, allowed Bloomberg to use the group’s six-story headquarters on Mott Street as his Chinatown campaign office—and the mayor proceeded to take upwards of 80 percent of the vote in the neighborhood, winning the overwhelming support of Chiu and other small business owners. But four years later, Chiu said his feelings have changed dramatically. Far from allowing the mayor to use his office, Chiu is now refusing to endorse Bloomberg, despite numerous entreaties from his campaign. In fact, he recently allowed an anti-Bloomberg group to hold a press conference at the group’s headquarters blasting the mayor. Bill Thompson has been trying to take advantage of the unrest, making several campaign stops in the neighborhood and holding a press conference at Park Row in late June to receive the endorsement of the Civic Center Residents Coalition. The population flexed its political muscles recently by electing Margaret Chin to the Council and unseating incumbent Alan Gerson. A bike lane on Grand Street that further narrowed the already tight street is a major concern, but Park Row appears to be the main point of contention for Chinatown voters. The thoroughfare once connected Chinatown with the rest of Lower Manhattan, but was shut down after 9/11 because of concerns about an attack on 1 Police Plaza. Eight years later, the street remains closed. Residents say that this has crippled both the economy and the quality of life in Chinatown, choking it from the rest of Manhattan, with traffic often clogging neighborhood streets. Late last year, the Economic Development Corporation, the Department of Transportation and the Police Department proposed a fix to alleviate the traffic flow problems: a $50 million plan to redevelop Chatham Square, a complicated seven-way intersection south of the Brooklyn Bridge. Most Chinatown business and civic leaders, however, have objected to the plan since it would essentially make the closing of Park Row permanent. They also say it was developed without hearing concerns from affected residents. Bloomberg appears aware of the unrest. In late June, he held a private dinner with 10 leading members of the Chinese business community and members of the Chinese press. Following the meeting, the Chinese press declared that the mayor had indicated he was open to reopening of Park Row. But when reporters then followed up with the mayor’s office after the meeting, it denied that the mayor had made any such promise. The Bloomberg campaign did not respond to a request for comments on this or other issues related to Chinatown, or about his standing in the neighborhood. Justin Yu, head of the powerful Chinese Consolidated Benevolent Association business group, attended the dinner. A Bloomberg ally, Yu said that the mayor had promised to delay the start of the Chatham Square development—it had been scheduled to begin in July—and had not specifically promised to advocate for Park Row’s reopening. 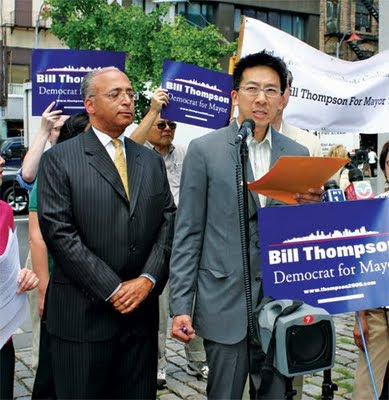 Yu, who is considered so influential locally that some people call him the mayor of Chinatown, said that though he opposed the Chatham Square proposal, he would continue to support Bloomberg because of the mayor’s record on education and crime. “Nobody satisfies people 100 percent of the time,” Yu explained. Others contend that Yu has divided loyalties because his daughter, Pauleen Yu, is the Chinatown liaison for Bloomberg’s community affairs unit. And they say the mere fact that Bloomberg is speaking only to the Chinatown elite, rather than seeking input from the community at large, represents the mayor’s attitude towards its residents. Others in the community wonder if the unrest with Bloomberg is as deep as some of the rhetoric suggests. During the 2005 campaign, they note, Bloomberg made a concession to the community by allowing bus traffic to again begin traveling down Park Row. But Lee said that while Thompson has been campaigning often in the neighborhood, Bloomberg had not yet held an appearance.